On 11th of December, an epic thing took place! No, the Mayan calendar didn't prepone the date fixed for the end of this world. But it's Micromax released an update for the hot selling A110. And it's really rare to see Indian brands bringing out updates, especially Micromax. The update contains a lot of bug fixes that came with the previous stock rom (though most of them were fixed by the active xda community). Note: This can be utilized even more by swapping your internal sdcard with the external sdcard, this way you have increased space for installation of apps, and even more space for downloading and storing data of heavy games. 1. M! Zone+ and M! Live(http://mimicromax.com) applications are integrated. 4. SD card memory changed from 2GB to 1GB. This 1GB added to internal storage for apps installation. I think I should now pay attention to what the title promised you: The steps to install Stock ROM v2. There are two methods, one is really very easy, while the other one is comparatively trickier. As I said, this one is quite easy, and just involves restoring of a cwm backup. Note: Restoring the backup won't repartition your internal storage, though all other changes will take effect. After you have downloaded CWM backup from the link above, extract it somewhere and transfer the extracted folder itself to /sdcard/clockworkmod/backup/ folder. (that's the default location where cwm backups are stored, clockworkmod recovery scans only this folder for backup files). Press Volume Up + Volume Down + Power button till a screen appears asking you if you want to go to recovery mode or to factory mode. Press Volume up to go recovery mode, now you are in the clockworkmod recovery. Using Volume down, scroll to the option that says "Backup and Restore". Backup your current version just in case something odd happens. Once the backup completes, choose the restore option and restore the backup of v2. Clear Dalvik Cache from Advanced Options in the cwm recovery. Reboot your phone. The first boot will take some time as Dalvik Cache is regenerated. Go to the Storage section, and if the internal storage is changed, then you can confirm that you have successfully flashed the new version. 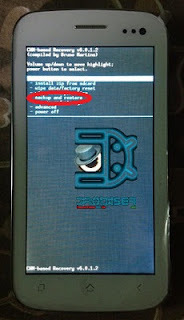 You may need to root again after flashing the stock rom. Also, the swapping mod needs to be reapplied. Follow this method only if you are not rooted, otherwise the upper method is way too easier and risk free. Install drivers for your phone using pdanet. You can use Micromax drivers in case pdanet doesn't work out for you (although it should). 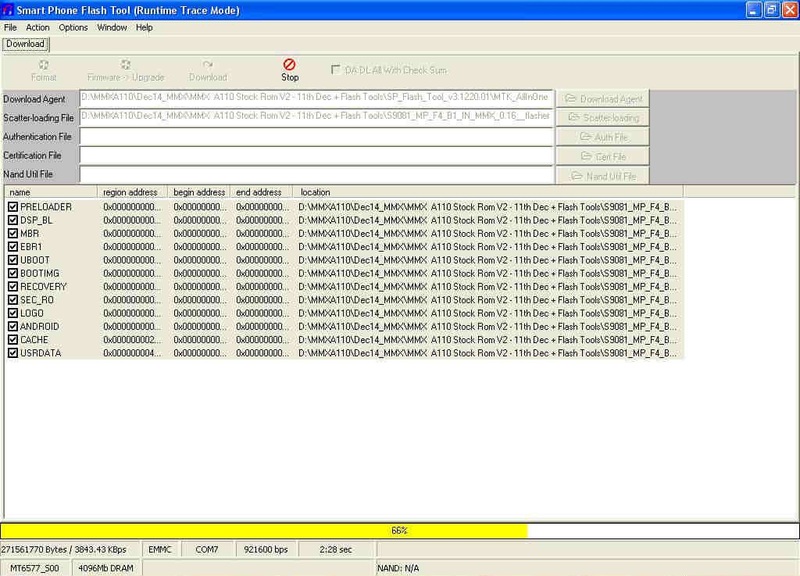 Extract and open the SP Flash Tools. 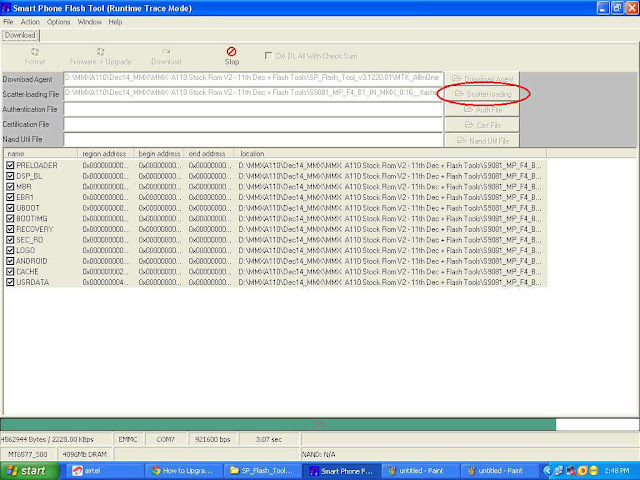 In SP Flash Tools, click on Scatter-Loading and the program will ask you the location of the scatter loading file for your device. This snapshot was taken after selecting the scatter loading file. The highlighted part was clicked to do that. 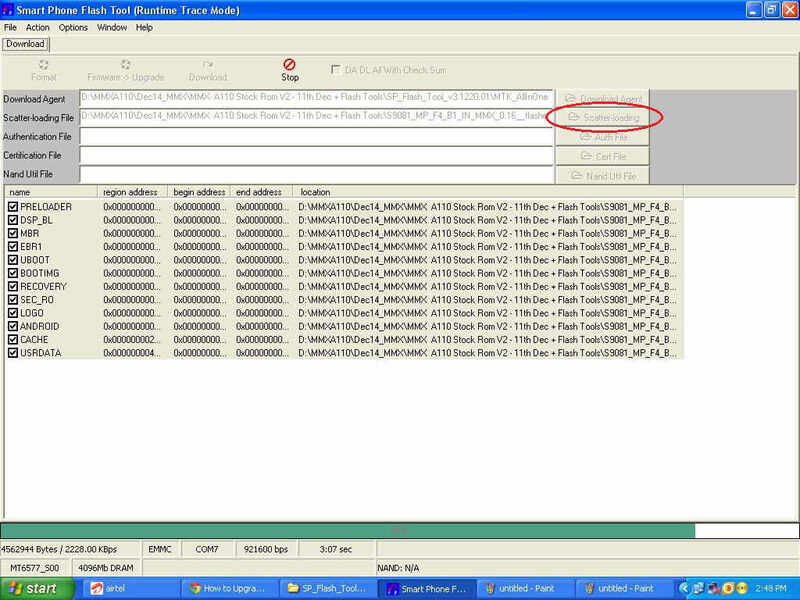 In the extracted folder of the stock rom, go to the folder named "S9081_MP_F4_B1_IN_MMX_0.16__flasher_user" and select the file "MT6577_Android_scatter_emmc" which is our scatter loading file. Switch off your phone (Remove the battery to make sure it is switched off). In Flash Tool, go to Options and Click USB Mode so that it is enabled. Click options again and then go to DA Download All > Speed and finally select High Speed. Click the Download option (present on the right of Firmware > Upgrade option) and the flash tool will start looking for your phone. Connect your phone now. The Flash Tool will start the flashing process, the progress of which can be viewed from a yellow progress bar at the bottom of the flash tool. Don't interrupt this process as it can potentially brick your device. Make sure no power interruption takes place. (Use a laptop to ensure this). After the process completes, a green ring will appear on your device signalling that the process was successful. You have to root your phone again if you want to. The second process seems to be lengthy but most of the steps would take just seconds to complete. I hope you are able to flash the new version successfully. Those who used the first method, wasn't it really easy guys? If anything red appears in the Flash Tools, it is a kinda warning that something is wrong. See what this xda user did to get out of that. Catch the full coverage of Micromax A110 on our website here.